Mohanish narrates- On next day, 22nd August, the day of Janmashtami, the day of birth of Lord Krishna, when we were to go for a divine dip in Gangamaiyya (River Ganga), Mohanji stayed with Vanamali Mataji in her ashram. I was wondering how things would unfold. The day began with bathing in the vibrations of Vishnusahsranamam chanting at Mataji’s ashram. Then we reached Vashishtha cave. We proceeded for Ganga snaan (dip in Ganges). We were guided every step through area outside the Vashishtha Cave into The Ganges. The water was cold. When I stepped into the water, I felt like I am re-entering the womb (original consciousness) of my mother. I dipped nine times. Everytime I came out of the water, I was re-born. After the nine dips I continued to stay in the water. Maa was caressing me. Then I dipped again and stayed inside for a longer time. My whole body was immersed. And I saw Mohanji’s spine merged with Maa Ganga’s spine. It was Shiva-Darshan. It was WOW!. Mohanish continues- After the darshan in Vashishtha Cave, we were blessed by Swami Chaitanyananda. We also did the pooja in Vashistha cave and received prasaad. It was simply amazing to realize how grace works. Something more interesting happened. And this reminded us about something that Mohanji had told us a few days earlier. Mohanji was telling us during the train journey from Delhi to Chandigarh that, “In the Himalayas there are many masters who don’t even look like saints. But they are really great. One must only have the eyes to recognize them, understand them and take their blessings.” So, as Sumit and I were leaving the premises, one old saint; he looked poor, walked out of nowhere. He looked at us and said, “So you did the pooja also huh? Ok. And did you eat the prasaad? Ok. Bless you.” And he walked away. We too kept walking. And just a few meters ahead another man walked out of nowhere and asked us whether we ate the prasaad or not. This time it struck to both of us about what Mohanji was telling. We offered our gratitude to both the Masters and walked further. Many such experiences were given to us in these 8 days. Well, He also gave us the eyes to see miracles. 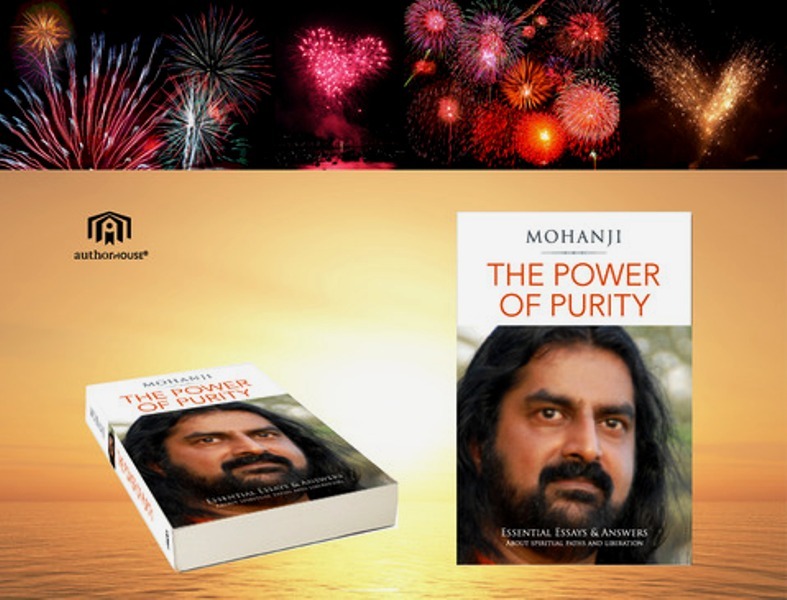 THE POWER OF PURITY is a compilation of Mohanji’s teachings up until the year 2011; his essays, correspondences and transcribed Questions & Answers during spiritual gatherings. It comprises all you ever wanted to know about spiritual paths, progress and liberation. It is published by Authorhouse UK. 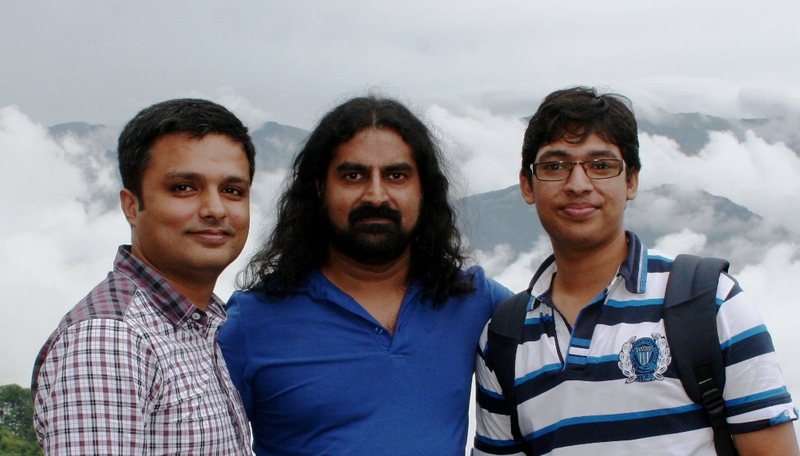 Sumit’s wife Sakshi and daughter Svasti along with friend Ashwani had joined the group in Rishikesh from Jammu. Sumit says, “Though, Mohanji could not physically come with us, but at the Ganga, we all felt his distinct presence. Once at the Vashishta cave, I went inside to meditate and on top of the Shivlingam there, I had the ‘darshan’ of Sathya Sai Baba. Baba was in a yellow robe and appeared as he looked in his younger days on top of and in front of the Shivlingam. The energies of that cave are so powerful that even while outside the cave if you close your eyes you are immediately transported to another plane. We then waited outside for the Swamiji who is very close to Mohanji, (Swami Chaitanyananda) and presented him a copy of Mohanji’s book, The Power of Purity. In the evening we boarded the train to Jammu. Our train was to arrive at the Jammu station at 4 in the morning. It was initially planned that a few people would receive Mohanji and then he would be taken to my house to take some rest before the morning’s activities started. But before we reached, the news of the powerful meditations at Delhi and Chandigarh had already reached and people poured in to receive the Master at the train station. We were pleasantly surprised to see 8-9 cars and at least 15 people who had gathered at that early morning hour to receive us. They presented flowers to Mohanji, collected the luggage and then we left for my place. Mohanish shares his different understanding of the event. He says, “It was a hectic travel till we reached Jammu, at Sumit’s residence. It was early morning 4 A M when people love to sleep and yet Mohanji was given an extremely loving welcome by all devotees. All were awakened more when they saw Mohanji. His energy made them physically drowsy but still all of them were awakened enough to remain receptive. Intense cleaning had already begun. Actually I witnessed Mohanji doing some work in the train itself. He had “reached” Jammu before the train arrived in Jammu. He, along with other higher entities, was working out situations in Jammu. Work was happening in all dimensions, not only in Jammu but just for experience-sharing purpose Jammu has been highlighted. Mohanji, instead of taking rest, said that he would come along and we would have a small meditation session at Sumit’s place as those who came to receive us were waiting for Mohanji as he took bath and made himself fresh. Mohanish adds that, “Mohanji took bath and was ready within minutes. I was tired and lazy. Slow. And, thus reached for meditation when it was just about to begin! Now when I recall everything, I feel that, for Mohanji, pain and physical fatigue exists but has no value. For all of us too it’s the same, pain and physical fatigue do exist, except we all tend to give it much value. Now while writing, I am learning this lesson”. Sumit continues- This totally unscheduled meditation turned out to be a very intense experience. Mohanji gave us some breathing exercises and techniques to throw ‘tamas’ (inertia) out of the system. This group of people had fought ‘tamas’ to get up early in the morning and be at the station at 4 am, and here they were immediately being taught a Divine way of doing so when and where they desired. Mohanji being Mohanji, there is not a single privilege he keeps to himself. 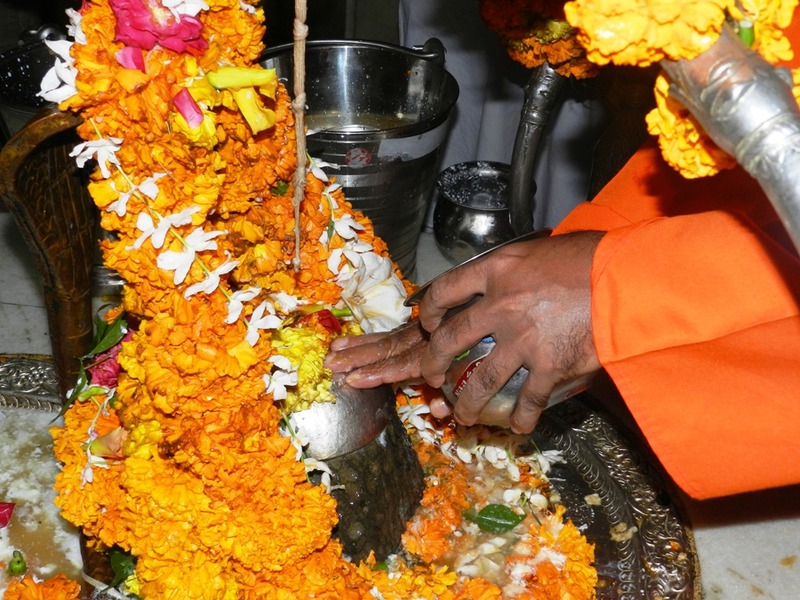 He asked us all to join in and we all did a similar abhishekam for Ridraksha Shivalingam in Jamvant Gufa, Jammu. After having breakfast, we went straight to ‘Jamvant gufa’, an ancient cave shrine temple dedicated to Lord Shiva. This cave has a natural Shivlingam in the shape of Rudraaksh, which appeared at this place on its own. That is why it is called a ‘Swayambhu Shivlingam”. Normally nobody is allowed to touch this Shivlingam and is always covered with flowers etc, but seeing Mohanji, the priest himself said that Mohanji could do anything he liked, and even allowed us to take pictures. It was but natural- Shiva worshipping Shiva. Rajesh was already there with the ‘samagri’ (goods required for pooja) for Mohanji to perform a ‘Panchamrit abhishekam’ with milk, curd, honey, ghee and Gangajal (holy water from Ganges). Mohanji being Mohanji, there is not a single privilege he keeps to himself. He asked us all to join in and we all did a similar abhishekam at this magnificent ancient temple. The priest also handed over the basket of Prasadam to Mohanji for distributing to all. We also performed abhishek to “Naga” snake deities and Lord Shani, one of the most dreaded planet. Shani is very famous for destroying one’s ego through providing helpless situations and bringing its subjects closer to God. At 4.30 pm, we had a meditation session with around 55 people. Shaktipat was given by Mohanji and a question and answer round followed. Here, an incident happened which none of us knew about. Ashwani had discovered some mistake in the generator being filled with kerosene oil instead of diesel. He tried to take out the kerosene and in the process, accidentally swallowed a substantial quantity of kerosene oil. He vomited some out, but fell very sick immediately after. Nevertheless, he sat for the meditation where he had a very intense experience. So much so that Mohanish while giving the Shaktipat and Rajesh sitting next to him also experienced that powerful energy in Ashwini. The next day we went to ‘Kud’, located about 6000 feet above sea level, on the way to Sri Nagar. A winding up road of 90 kms from Jammu leads to Kud. We left Jammu at 7 in the morning. It took us three hours to reach Kud. We had planned ‘Satsang’ with about 4-5 people, but as the news had spread, more and more people joined in. The moment we stepped out of the cars, it started drizzling, as if Mohanji was greeted by the Masters. Raining is considered very auspicious. Many questions were answered during the ‘Satsang’. Mohanji asked Mohanish and me, Sumit to share our experiences. I didn’t know from where the words were coming while I talked. Talking had always happened earlier, in Mohanji’s absence, when we conduct meditation programs. When I had to speak, Mohanji always took over and spoke, but this was the first time I was asked to talk in his presence. Still, Mohanji took over and all questions were answered through me. Mohanish adds- We all drove up to this special divine and celestial-like place named Kud for Satsang with Mohanji. Mohanji too loved to witness that place and be there. We had a great satsang. I wasn’t much attentive but I know that whoever asked Him a question got a perfect and precise answer. Then someone asked about other dimensions and planes where Mohanji works. To which Mohanji said, “If I tell you about the happenings in other planes then may be, you may doubt me. I could be bluffing or lying, right? Someone who has witnessed me operating in other dimensions should talk about it. Let Mohanish and Sumit tell you about the other dimensions.” And He called us. I asked Sumit to speak because I was a bit hesitant. I thought people may not accept this small 21 year old sharing such high experiences. And doubting me would be like doubting Mohanji’s expeditions since it’s because of Him that we get to see all that. Sumit spoke well. He spoke with lot of involvement and passion. Actually even he was a bit hesitating in the beginning, perhaps due to Mohanji’s physical presence. Mohanji was sitting silent. I remember Sumit telling me, “Yaar (dear friend in Hindi); when I went there and sat next to Mohanji and saw all the people, I forgot the question. So I asked for the question to be repeated. Then I don’t know from where I got the insight to answer. Initial couple of sentences, I analyzed. But later on I was comfortable and knowledge was pouring.” I was watching all this happen. Then suddenly Mohanji commanded, “Eh Mohanish come here and tell them. Why are you sitting there? You should talk. Share with them. They need to experience your understanding too.” Hearing this I silently walked there with trembling feet and shared a few experiences. All of them received it well. Few people later told me that their doubts were cleared about some things. All what is written above is definitely an interesting experience for you all, but for me it’s more than that….. I learnt that whatever experiences we get, they are given to us due to eligibility. Each of us gets something different. So we must have gratitude for that and share it whenever required to elevate others consciousness. I also learnt that when Master commands, just follow. Be sure that each of your next steps are calculated and pre-set. The point is not that ‘you’ are sharing the experience; it is that ‘they’ are receiving it! This satsang ended at 2:30 pm, we realized that nobody had anything for breakfast! Nobody was hungry! We carried home-made packed food for breakfast but the satsang was so intense that everyone just forgot about the breakfast. The only thing on group’s mind was to make the most of this special opportunity to be with Mohanji. After the satsang was over, the drizzling scene that welcomed Mohanji was replaced by beautiful scenery. It appeared the whole creation was also helping us to welcome and serve Mohanji. There Ashwani’s health was deteriorating. He had a lot of pain in his lungs’ area. We took him to the hospital enroute, where he was referred to Jammu for further checkup. But Mohanji asked him not to worry and said that he would be fine. Mohanji blessed some vibhuti and gave it to him. This morning things again happened very spontaneously. We had a totally unplanned meditation session after Baba’s Aarti at 7 am. All of us were taken to a different plane during the aarti. There was so much love in the air that it is not describable. Ashwani sat through the meditation but was very uncomfortable. On being given the Shaktipat he felt better. He was again given vibhuti and water and was reassured by Mohanji. He replied that he was not worried, but instead, reflected on an old prediction by an astrologer, which said that Ashwani might encounter some physical accident, or ailment, which could lead to a paralysis or death. Ashwani was sure that this entire episode had taken care of that karma. Another team member, Sachin had a very deep experience. Even after 10-15 minutes after the music stopped, he was still in deep meditation. Mohanji took Sachin to a different world where he met all the gurus and Masters and bowed to them. That afternoon when we left our place to drop Mohanji to the airport, Ajay Kher and other Jet airways staff gave HIM a very warm and cordial welcome. The Jammu airport falls in a very high security zone, one has to go through lots of checks and other formalities even after the boarding pass is handed over. Ajay Kher perfectly took care of this. Mohanji left for Delhi. Next day he was to travel back to Muscat. However, Mohanish and Moushami stayed back at Jammu and we went to Mata Vaishni Devi the next day. Mohanish continues- I am sorry friends but I cannot write anything further. There are many more experiences I received in these 9 days like the visit to Vanamali Mata Ashram, Laxman Jhoola and shopping, vomiting incidence while returning from Kud, Aparrna didi’s lost camera being miraculously found, great moments in The Attic (Connaught place, Delhi), Chandigarh school meditation, Kilkari Seva etc. Such a short span of time but so much we did. We were beyond time and space. All happened because of grace. It always happens because of grace and presence of Mohanji. If we think about Mohanji, be it positively or through criticizing Him, we are still ‘connecting’ with Mohanji. So every step we take we are churned. All experiences we are given are because we have the capacity to witness them and go through. Maybe, most of us will not read these experiences again, ever, but I feel we should remember always that whatever happened in this Delhi trip is just a large rock fit into a pair of socks. It is not that when Mohanji is around all this happens. This has happened with me before too, but I never had the insight to interpret it. Through regular meditations and shaktipath transfers, all of us are getting that insight. Sumit deeply feels and concludes that, “At the planning stage we were concerned how everything would be managed. Now I realize that when the intention is purely to serve; one does not have to look for help because the whole creation supports manifestation of that pure intention. More than 500 people could actually attend the meditation session and receive individual Shaktipat from Mohanji. When Mohanji was giving Shaktipat, we felt as if time is standing still. The Past, Present and Future were all in front of Mohanji. Mohanji took care of us without telling us that he is taking care of us. Mohanji, we are waiting for you to be in North India again. I thank each and everyone who contributed selflessly to organize these 7days. I thank all those who attended meditation and Annadan. I am presently witnessing the transformation happening in Delhi, Chandigarh and Jammu. Mohanji, you moved all of us. You shook us and connected us to this Pure White Tradition and The Path of Liberation which beautifully taught us value of selflessness, unconditional love, gratitude and faith in Masters. Mohanji, please forgive us if knowingly or unknowingly we made mistakes. 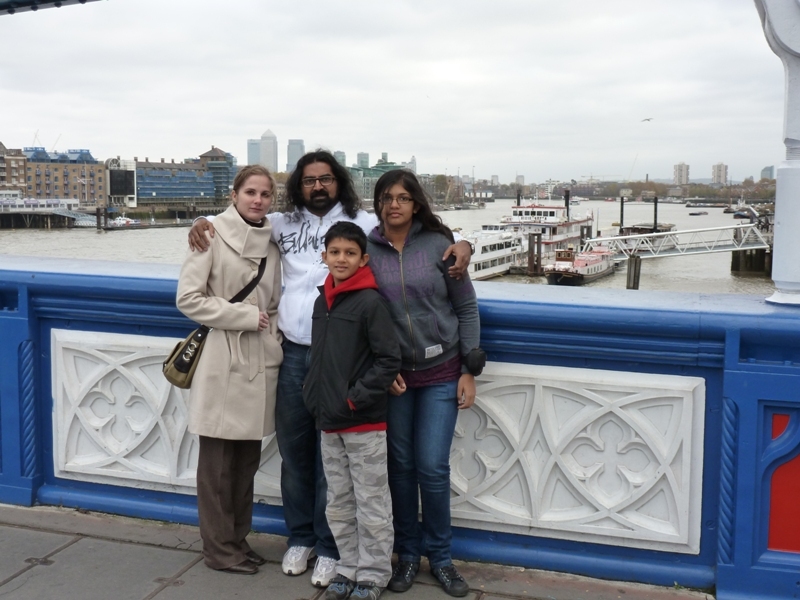 Mr.Vijay Ramanaidoo and his wife Ranjana found out about of Mohanji from their friends. After reading his blogs sincerely they had a deep urge to meet Mohanji in person. And ultimately they got to host Mohanji in their house, take him around as well as to organise two meditations in London in a short period of time! Here, Vijay lucidly writes about his overall experience of being with Mohanji. Also, Ranjan Premchandra, who is a very active Sai memeber and looks after the whole organisation and instrumental of setting up of Sai centre, writes his breathtaking experiences with Mohanji. It was a very short trip. Mohanji arrived on November 4th evening and left on November 9th evening. In between, he was completely busy and absorbed in official meetings for three days. Hence, it is amazing to note how much is achieved in such a short span of time. A big thanks to Vijay and Family, Jolita Kelias and all others who open-heartedly received Mohanji and made good use of his time and presence in London. I came to know about Mohanji’s impending trip to the UK less than two weeks before his arrival. He was coming to the UK for five days between the 4th and 9th of November 2011. The primary purpose of his visit was for a three day shipping conference but he was happy to conduct meditations or satsangs in the two days before the conference commenced for people who were interested in experiencing his meditations. There was no compulsion or expectation whatsoever. In a very short period, as if guided by unseen divine hands, everything got organised! 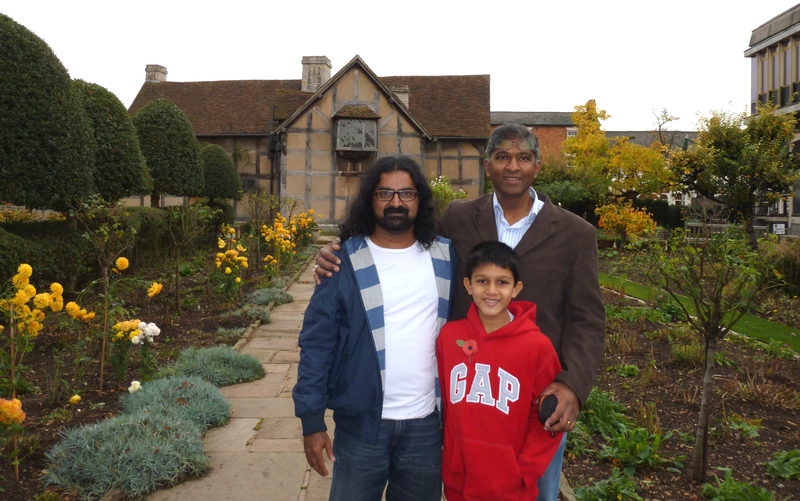 Prior to his arrival, at very short notice, we arranged two meditation programmes (one public programme and another one at my home), a visit to Stratford-Upon-Avon (Shakespeare’s birthplace), as well as some sightseeing around London before the conference started. Mohanji passes emigration in record time! Mohanji was scheduled to arrive on November 4th evening at 17:45h. I arrived at the airport at around 17:55h together with my son Vivek. I took my time, bought some flowers to welcome him and sat down, not even looking at who was coming through the terminal as I was fully aware of the long time taken at Heathrow airport for clearance through the emigration desk. On the same evening, a few people wanted to meet him and we had scheduled a meeting at my place. Therefore I was worried that we would be delayed especially as it was Mohanji’s first trip to the UK. Usually it takes at least an hour to come out from the airport after landing, especially if you have a non-EU passport. To my absolute astonishment he arrived in the arrivals lounge thirty minutes after the plane landed, this is extremely unusual for Heathrow. In my long experience in London, 30 minutes is a record time for someone to come out through baggage hall, passport control, customs etc!! Thus, we were then able to come home in good time for the meeting. Even though Mohanji had an 8 hour long flight, he showed no signs of jet lag or tiredness and looked fresh and cheerful. This was a real surprise because he had been ill due to flu, cold and fever the day before and could not even speak properly while at Muscat airport, awaiting the flight for London! These small but significant incidents set the tone for how the whole trip went on with divine timing and not even a minute wasted. It is said that there is no need to seek a Guru because the right Guru will come to you when you are eligible. However my wife Ranjana did not expect the Guru to arrive home in jeans, trainers, T-shirt and casual jacket! When we discussed about Mohanji’s visit toLondon, she was quite worried and anxious as to how to take care of him, or make sure that he was comfortable at our place. But, when she saw him at the door, all her worries and anxieties about hosting someone of the stature of Mohanji completely vanished. Mohanji did not look like a demanding Guru at all! When we had previously asked him about his preferences, he replied that his needs are very small – simple vegetarian food and a place to sleep! This was 100% true. He needed nothing else. Our meeting that evening was with the founders of the Light in London Association. 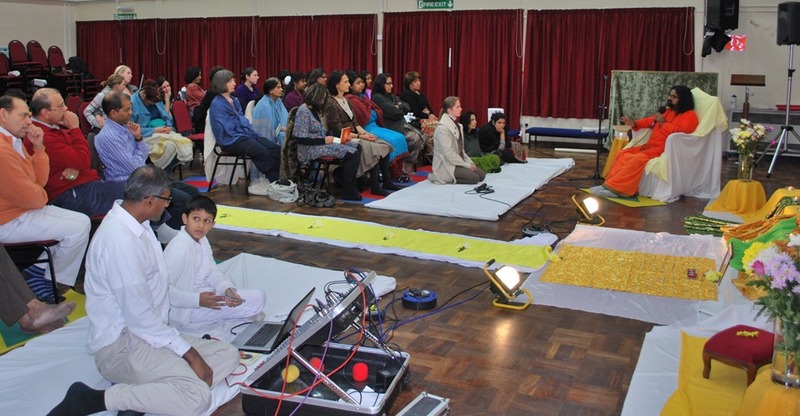 This is a group formed to disseminate details of spiritual programmes held by gurus, saints and masters in London. They wanted to meet him prior to informing their members of the public BTW programme. They had previously communicated with Mohanji while he was in Oman. Mohanji had told me in an earlier email that he was happy to meet them even on the day of his arrival, not for the sake of publicity but just to serve the needs of those who have been waiting to attend the meditation. We had a wonderful Q and A satsang which lasted until midnight and Mohanji still looked fresh! No jet lag. No tiredness! No sickness! They asked Mohanji lots of questions about his programmes and whether or not he charges anything for his programmes. He confirmed that there is no fee and that all his spiritual programmes are performed as SEVA or Selfless Service. He works for his living! They asked about other Gurus and also posed questions on various spiritual topics. Half way through the meeting, one of the team members was sufficiently satisfied and used my computer to post details of the public programme we had organised inLondon on their website and send an email out to all their members. This meeting was to prove very significant as many of the Light inLondon members subsequently attended the meditations and many sought Mohanji’s help and guidance. Some even travelled a very long distance to meet him. 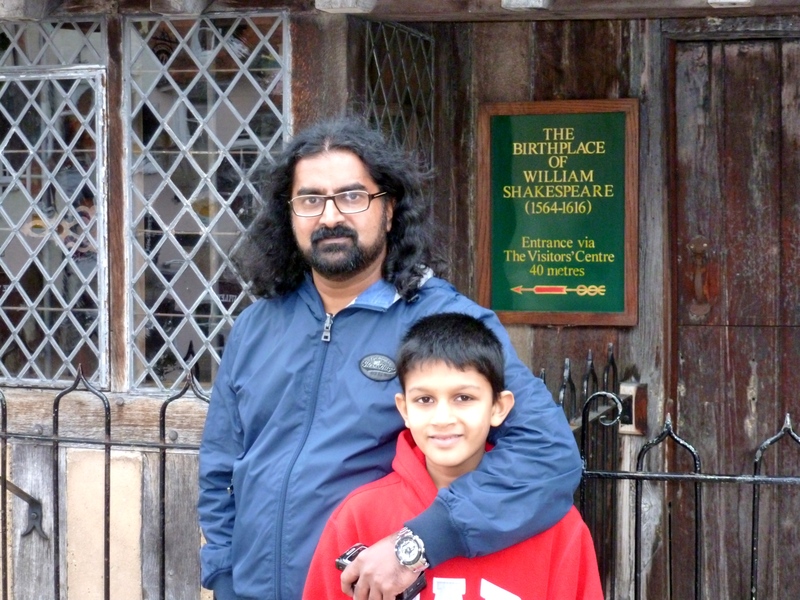 The next day, I took Mohanji to Shakespeare’s birthplace in Stratford-Upon-Avona ccompanied by my son Vivek. It was a two hour drive from Londonon the M40 motorway. Stratford-Upon-Avonis a beautiful town with a lot of history and tradition. 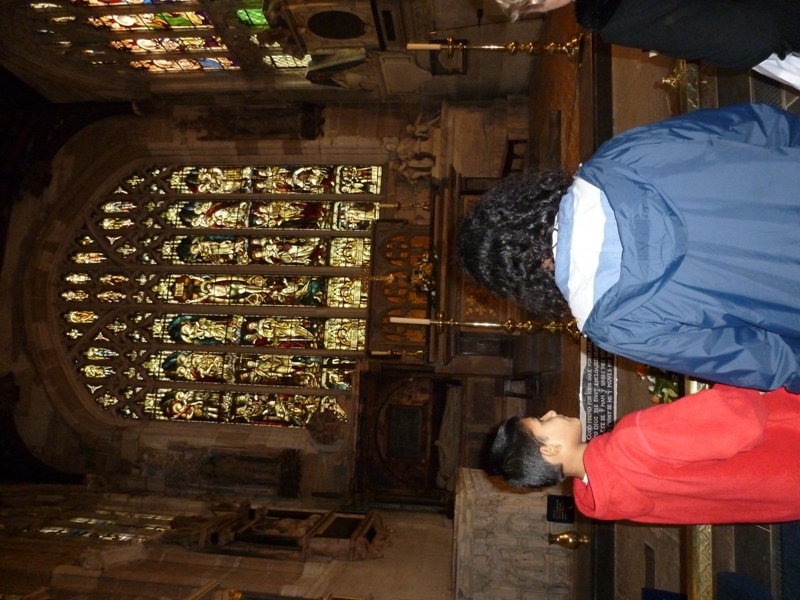 We had a really nice time, visiting the Shakespeare centre, Shakespeare’s birthplace, the place where he lived, his daughter’s place, the chapel and the church where he and his family were buried. The place is steeped in history, very beautiful, very peaceful and very scenic. Mohanji enjoyed the positive vibrations there and the quietness of village life. We arrived home by 17:30H, just in time for the programme that we had scheduled at our home. Ranjana and her sister, Rajshree, had done most of the preparations and cooking. The programme started at 19:00H. We had a beautiful meditation and this was followed by a very nice question and answer satsang. Mohanji’s answers were lightning quick, insightful, humorous and informative. This was followed by Shaktipat given by Mohanji and then dinner. After that, some people stayed behind for a further satsang which lasted until 01:00H in the morning! 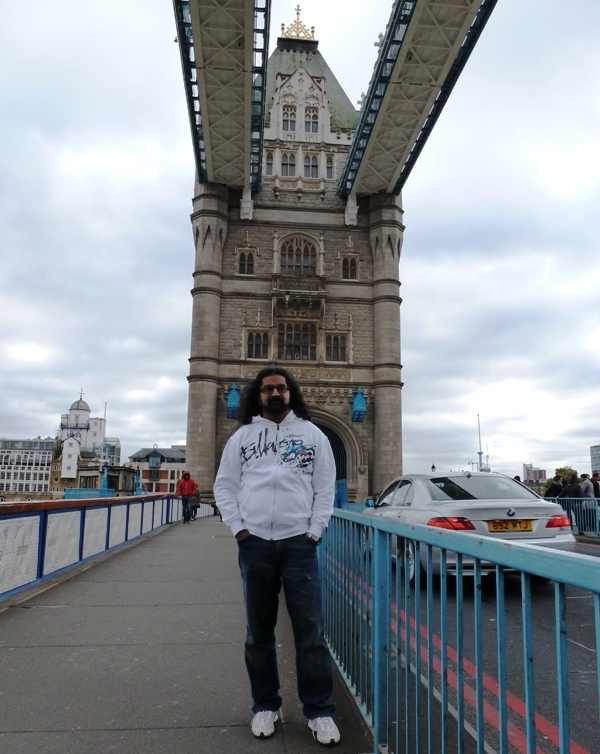 The next day, Sunday 6th of November, Vivek, Nilam and Jolita and I took Mohanji for sightseeing. We visited various sites including Waterloo bridge, Westminster bridge, Westminster Abbey, Houses of Parliament, Buckingham Palace, Horseguards parade, Trafalgar Square, Tower bridge and other sites such as Millenium wheel and the wonderful London architecture. Jolita has also written about Mohanji’s visit to UK from her heart. 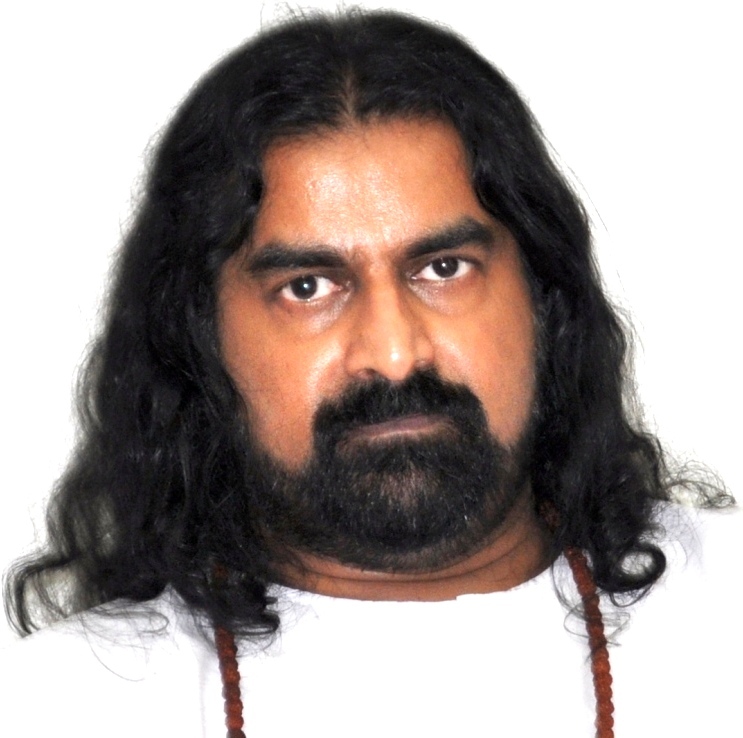 You can read it at this link – http://jolitaasmara.blogspot.com/2011/11/mohanji-path-of-his-heart.html. After arrival home and a late lunch we travelled to our Sathya Sai Baba centre where Mohanji performed the Aarthi. Then, we got ready for the public programme which was held in the same hall. The hall was rearranged and the altar was set up with pictures of Sathya Sai, Shirdi Sai, Mahavatar Babaji, Paramahamsa Yogananda and Lord Jesus. Mohanji expressed deep reverence and gratitude towards all the Great Masters. Pilgrims started to arrive and it was quite significant to note that many of Light inLondon members turned up. The programme started on time at 18:30H with a short introduction by Jolita followed by breathing exercises and a beautiful meditation. This was followed by Q & A satsang and Shaktipat given by Mohanji. After this we had some light refreshments which had been lovingly prepared by the volunteers. The whole programme finished by 21:45h. Some people had traveled long distances, to attend the programme – from places like Weymouth and Birmingham which are about 100 miles away. All enjoyed it and some people wanted to know more details of BTW meditation programmes. Tuesday the 8th was conference day for Mohanji. We went together by underground train (tube) to the Grand Hyatt which was the conference venue. He spent the whole day there and I picked him up in the evening after the conference. We then proceeded to the house of our good friends who help to run the Sathya Sai centre. Various friends from our Sai group had gathered there to meet him. Mohanji was welcomed with Kalash and Coconut and led to his seat. Children led the chants such as Gayathri mantra followed by chanting of the first Anuvaka of the Rudram. We could see Mohanji entering into a trance state with the Shiva chants. Some perceived the smell of sandalwood from his body. The satsang went well and Mohanji answered all the questions with lots of humour. There were some wonderful questions from children too. Mohanji seemed never tired of answering questions and showed immense patience, especially after a whole day of conference and business meetings. As he started performing Shaktipat, Mohanji increasingly developed a cough. Obviously, he was cleansing people and taking their negativity out through his own body. When Master’s cleanse karmas of people, Masters do suffer physically for a short duration of time. Mohanji must have removed a lot of things from people which had caused his condition to worsen throughout the session, but he soon recovered. This was amazing!!! In spite of his hectic schedule, Mohanji untiringly attended everyone and their questions. After the meditation programmes had finished, on the days that Mohanji was working and attending the shipping conference, I received many calls and requests to speak or meet with him. I did not want to disturb him as I knew that he was quite busy with business meetings. Yet, when I met him after the conference and informed him, Mohanji was happy to accommodate them all, as best as he could. Therefore, on the car journeys back from the conference or in the late evenings after work, Mohanji either met with or spoke to people until late at night. Even on the day he was leaving forShanghai, people came to meet him at the hotel where the conference was held prior to going to the airport! If Mohanji had stayed here longer, more and more people would have come to meet him. Many were referred by those who met him in the previous days and had great experiences. During Mohanji’s visit, I was uniquely privileged in being able to see Mohanji in various guises: as a guest, a host, a commuter, a tourist, a businessman, a friend, a guide, a Guru and a Master. One of the main things that surprised me was how everything, every activity – even those totally diverse in nature, fell into place on each day so that there was no time wasted at all. NO WASTAGE! Any potential free time rapidly filled up with people coming to see him. It was also enlightening to see that Mohanji exhibited no stress, tension or worry at the demanding schedule. He needed no rest. He was relaxed all the time and never rushed anyone. We also enjoyed his positive energy in our home. Both my wife and I could feel a very positive energy activating the chakras just by looking at him, talking to him, being with him or even sitting in the chair that he had just vacated! Mohanji’s lifestyle is unique. He literally flows through various aspects of existence effortlessly. A Spiritual Master, a professional at work, a husband, a father, a friend etc, etc. Yet, he seemed relaxed and unaffected by anything. His life is an imitable example to those of us who struggle to put the pieces of diverse existence together. His professional life is extremely stressful. He works for his living. He conducts all his spiritual services completely free. He does lots of charity. He is married. He has a child. At the same time, he is highly spiritual. Just imagine how much work he does each day! He is available to all those who seek him. Well, this is true all-rounder-ship in its absolute sense. Mohanji says “One should not run away from his given responsibilities. Work is Worship. Never be an escapist. You can never escape from the life that you have created. So, enjoy life, enjoy all its ups and downs, be a witness and flow with it, through it. Gratitude is the key. Unconditionality is the path. Love is the life breath”. 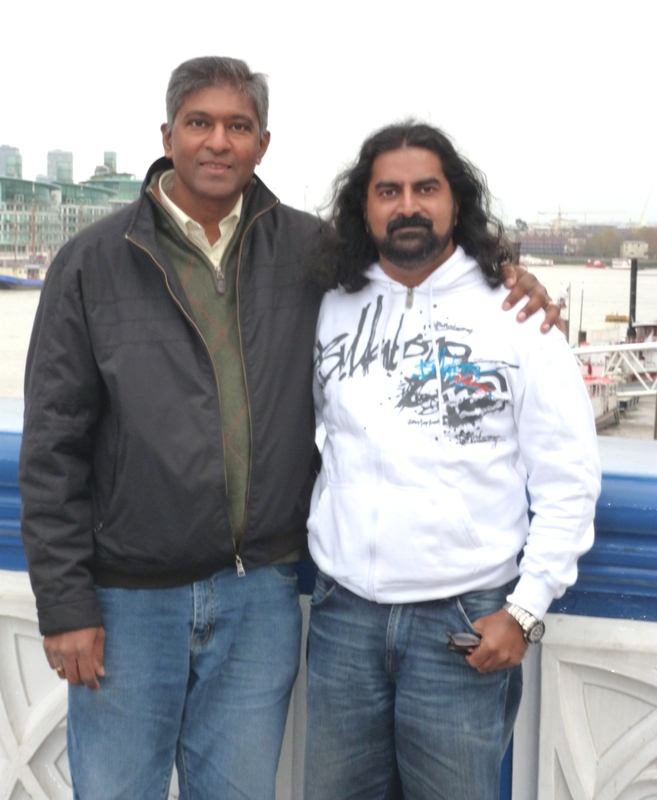 Ranjana did not expect the Guru to arrive home in jeans, trainers, T-shirt and casual jacket! With Jolita, Vivek and Neelam with river Thames in the background. The highlight of the trip for most people was of course the satsangs and meditations that were held over the two days, even though almost all of them had never heard about Mohanji until his to the UK. Usually, it is human nature to have some apprehension towards someone whom we do not know about. 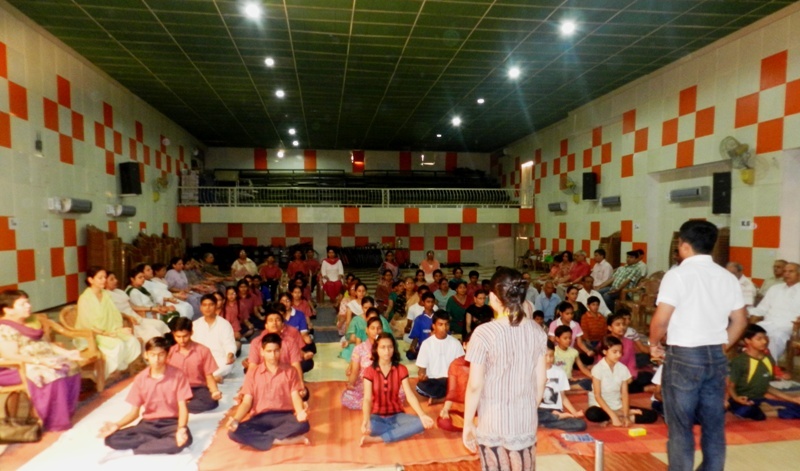 Yet, during the two meditation programmes, people had a great variety of experiences. These ranged from feeling the chakras, feeling a rising energy up the spine, feeling true blessing, feeling a touch on the head, seeing light and seeing various masters such as Shirdi Sai Baba and Sathya Sai Baba moving around blessing and talking to them. Some devotees had profound experiences during the Shaktipat. They were given insights into their karmas and past lives, solutions to problems, loving guidance, divine healing, positive energy and blessings and a lot more. Many people had emotional experiences and wept with joy and gratitude. Even now, all these days after the departure of Mohanji, people who attended the meditations are having wonderful dreams, visions and experiences. Some have had a complete transformation. One of our friends was astonished to discover a picture of Mohanji’s eyes at her workplace computer between the mouse and the mouse mat! This was definitely not there before and no one in her workplace knew of Mohanji! Where did that picture come from?!! The highlight of the trip for most people was of course the satsangs and meditations held over the two days, even though almost all of them had never heard about Mohanji before. Ranjan, my friend witnessed Shirdi Sai Baba coming out of a picture during bhajans. Ranjan also dreamt that he was performing Aarthi to Sathya Sai Baba, then, as Baba walked away, Mohanji appeared. He therefore stopped performing the Aarthi and covered the flame with his hand. Baba then turned around and told him that it is OK and he should continue to perform the Aarthi to Mohanji! You will read Ranjans’s detailed experiences below. There is a divine plan in everything and we eagerly wait to see how this divine plan evolves. I understood that Mohanji is not restricted to his body, we can contact him at any time by connecting to Him through his eyes, into his vast consciousness. Some others are seeing divine lights of various colours. During the meditation when the arm is raised in blessing position, one person witnessed a divine blue light coming into him, circulating within him, exiting through the raised palm and then surrounding him. Like this, people are having many experiences. As Mohanji told us, this meditation is a communion with masters and masters do come, therefore we should do it with total reverence. We truly experience this. No words are wasted. Everything made sense. The time has flown by. The moments we have spent together with Mohanji will always be treasured. Many questions were answered and the opportunity to just be in his presence was a great blessing for us. He has been so unassuming and approachable. So much is done in so little time! Numerous people were blessed and their hearts touched by Mohanji’s visit. We started feeling the sadness of his impending departure well before he left for Shanghaion 9th November, and we pray that we can always be connected so the absence will not be felt. He always said “Work is Worship” for him. We saw that in practice. He never compromised on his official appointments, as well as spiritual. All was performed with ease and effortlessness; and with total application. He was never tired either. Moreover, even though our schedule was so hectic, packed with endless appointments and Tube train travel, none of us felt any tiredness and, surprisingly enough, even the need for food was less! 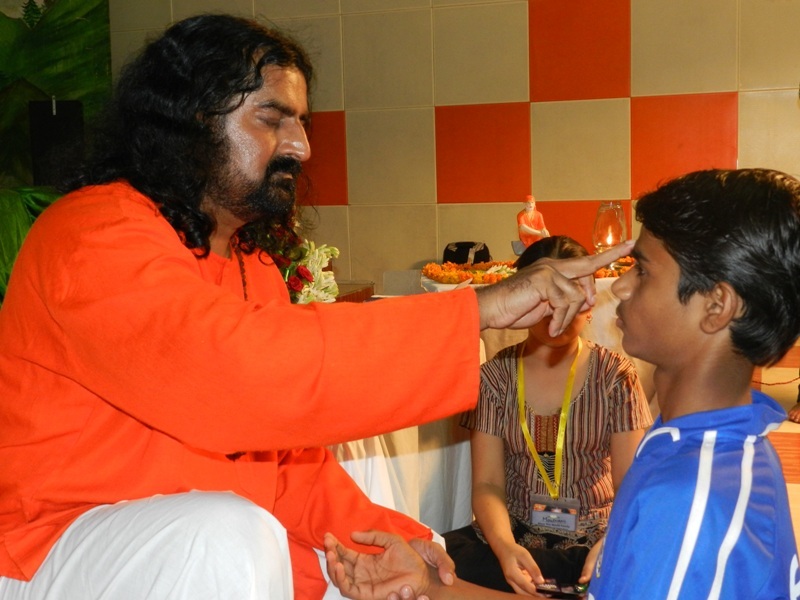 The divine gives us plenty of extra energy when we whole-heartedly perform selfless service. On the subject of rest, Mohanji has said “What is rest? The body is taken for performing on earth. Rest means death, lack of body to perform. While we are in the body, what is the need for rest? Work is worship. Work selflessly, truthfully, with dedication and unconditional love. That makes life complete.” He could shut himself from the outside world and sleep in seconds, if he wants to. Then, even the sound of his breathing does not exist!! He truly lives his teachings. Like any true master, his life itself is his teaching. No tall claims. No vague promises. No pretensions. Just natural and spontaneous always. All in all, Mohanji’s visit to the UK was one of the highlights of our lives and it is an experience that we will never forget. We feel very blessed, privileged and extremely grateful for this divine experience! I have been wondering for some time whether it is good to share personal experiences in meditation with others. Sometimes it may not be appropriate as not everyone may appreciate or accept them. However, this morning I had some free time and for some reason I went into Mohanji’s website. I started randomly reading some articles and found one that specifically caught my eye where Mohanji stated how important it is to share the experiences received during meditation, and how holding back accumulates attachment. Having been hesitant to do so all this time, I have now decided to share mine. 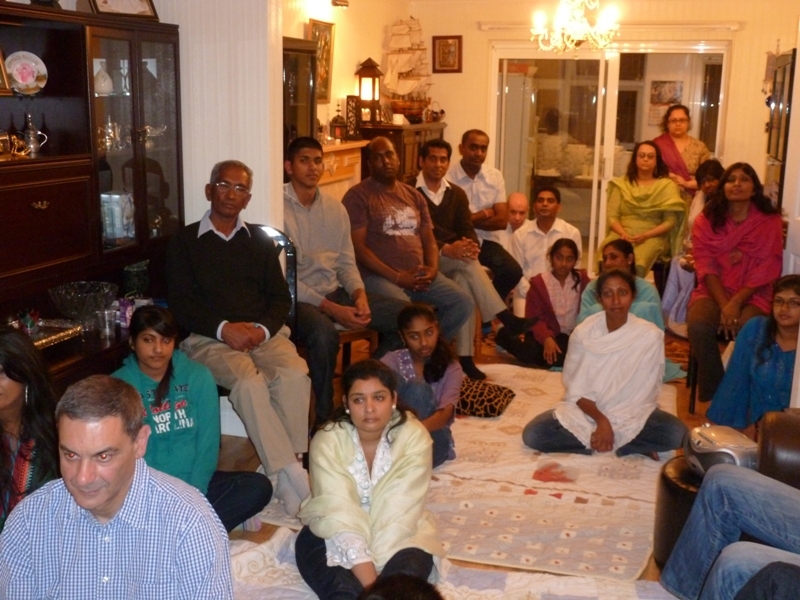 Our family (together with a group of other Sai devotees) have been hosting weekly Rudram chanting and study circle sessions (an activity recommended by Sathya Sai Baba to discuss his teachings) in our houses for over two years now. About a year ago we added a regular session of Swami’s light meditation in these sessions. I have always wondered what I should expect and experience from these meditations. This has been a topic that we have discussed at length in many Study circles sessions, but I have not yet received satisfactory answers. I often ask Brintha (my wife) what her experiences were, and as I compared mine to hers and everyone else, I thought that maybe I was not yet ready for the higher experiences. Also when I try to visualise Swami during the meditation, He only appears for a short while and that’s about it. When I first heard that Mohanji was coming to the UK and staying in the house of my friends Rajesh and Ranjana, Brintha and I decided to attend the meditation session at their home with an open mind. The fact that they were so excited and overwhelmed by his impending arrival convinced me that we should attend. Nowadays there are so many different Gurus around and some of them do mislead people. But as we are trusting devotees of Sathya Sai Baba we always try to appreciate and take part in all spiritual activities, no matter who is conducting them. On the day of the meditation at Rajesh’s house I came in late as I had to pick up my daughter from her tuition class. The meditation had already started and I was not sure whether to come in or not, but Nilam (Rajesh’s daughter) prompted me to go in and sit down. I sat down at the very back and it took me a short while to settle down, but then my mind started connecting to the process of meditation. We were in the ‘silent slot’ of the meditation where you call upon and thank all your Gurus. I went through the list of all my Gurus, from first standard to university, and the very last was Swami, our sweet Lord Sathya Sai. Unlike all my other Gurus, who just came and went, I had a whole experience with Swami – I was in Prashanthi, and Swami was walking around. He came to the Men’s side, and stopped in front of me, put His hand on my head and gave me Padanamaskar. Then I was walking behind Him into the Interview Room, and my whole family was there. Swami sat down on a swing, and as the swing moved back He went into darkness so we couldn’t see Him, then, as the swing came forwards, He ‘reappeared’. This happened throughout the interview. Towards the end, Swami got up from the swing and showered my family and I with streaks of blue light. Normally He just holds His hands above His head, but here He was ‘pulling’ the light from the sky, and it was landing on our heads like lightning. This was definitely the most profound experience I have ever had with Swami and this meditation was the first one where I experienced Swami with me the whole way through. The question and answer session after the meditation was very enlightening. Mohanji answered all the questions in a topical and practical way which can be easily understood and accepted by the younger generation – the Theory of Relativity, Big Bang Theory, formation of Lingam, how we all have unconditional love and how we can give and receive this love. An example Mohanji used was that of us as customers – we all have an unlimited supply of money (i.e. love) which we use to buy only what we want from the shop. Whatever we don’t need, we don’t buy (i.e. you only receive love from other people. You are unaffected by their jealousy or anger etc, because you don’t accept it or buy it). Mohanji’s visit to our Sai Centre the next day, where he conducted the meditation workshop, was another beautiful experience, with so many people sitting together in meditation. The amount of ‘blue light’ energy I experienced through my meditation was amazing and unexplainable. 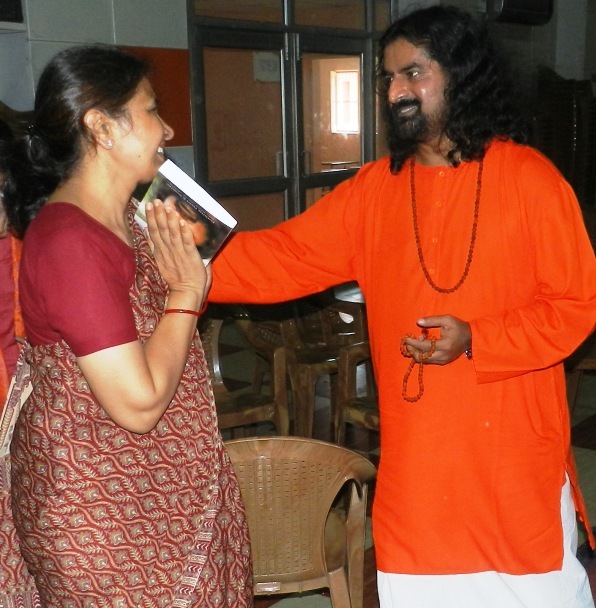 Again, Swami was with me throughout – walking, talking and giving me endless Padanamaskar. Amazingly, all of this appeared to be taking place in Prashanthi Nilayam. The Shakthipat at the end was a soothing divine tonic for cleansing the internal body. Mohanji’s visit to our house was another unexpected and unforgettable experience. As He walked into the house, I felt the divine presence. I was so pleased that Mohanji accepted our request to chant Rudram in his presence – we were all so happy but nervous at the same time, however we were overjoyed at chanting it. Mohanji’s explanation of why Rudram has to be chanted not just from the throat, but through the spine was amazing. 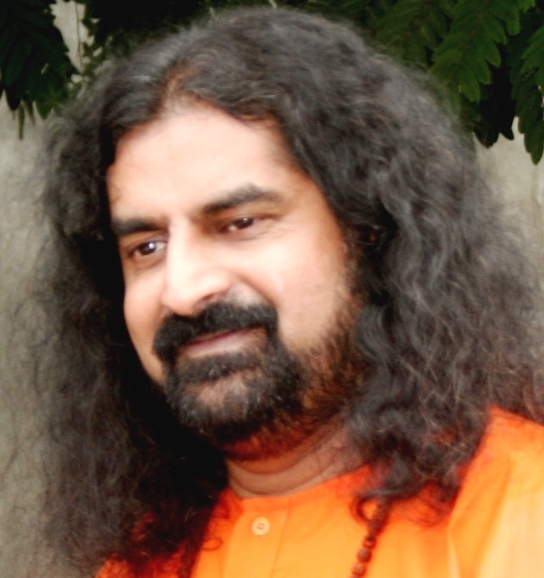 The quotes He related from Adi Shankara, Babaji and Swami (Sathya Sai Baba) made me feel that it was a message from Swami directly, and was delivered to us personally. 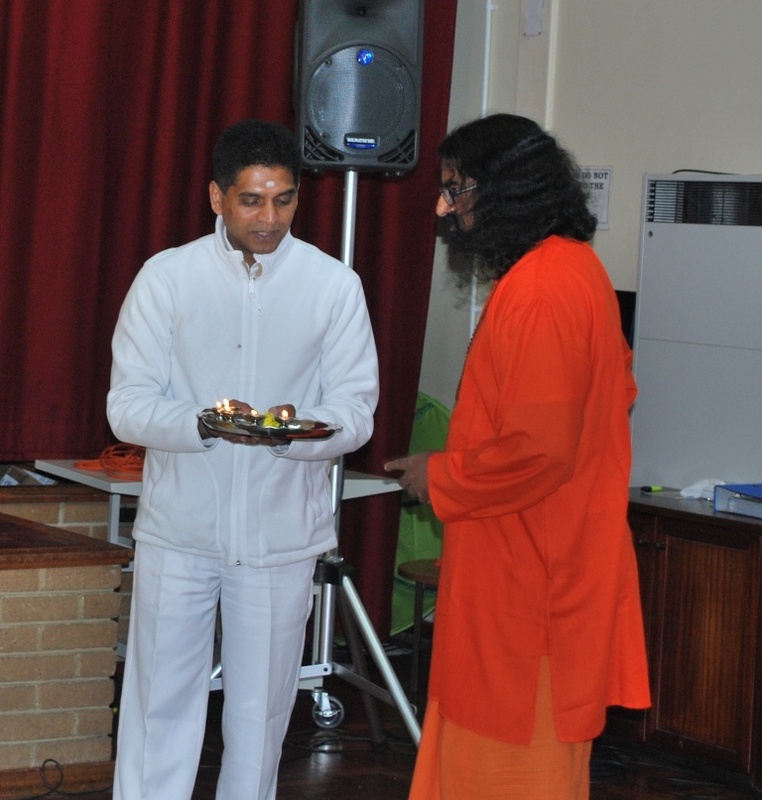 A few days later I had a dream – our Rudram group were busy preparing for some event, and all of a sudden Swami was coming. We quickly got ready for the Aarthi, and as I was performing the Aarthi to Swami, He smiled and in His usual manner slowly walked past. As He turned around, I saw Mohanji coming behind him, so I stopped doing the Aarthi and was not sure what to do. Swami turned around to me and said these Golden Words: “You can do the Aarthi to Him”. I then woke up and looked at the time – it was 4.24 in the morning – Brahma Muhurtha!!! As she was reading this passage, Mohanji suddenly came in to my mind. I honestly don’t know why, and He came into my mind just as Dharpana was reading the very words “You will experience Me in different manifestations of My Form”. It may be difficult for many of you to believe this, but this is what I experienced. Soon after the Pooja, we went to our Friday Rudram Chanting session which was hosted that evening by one of our friends called Skandha. We started preparing for the meditation after chanting. Unfortunately the CD we were playing was somehow corrupted, and Mohanji’s voice was coming out distorted from the speakers. 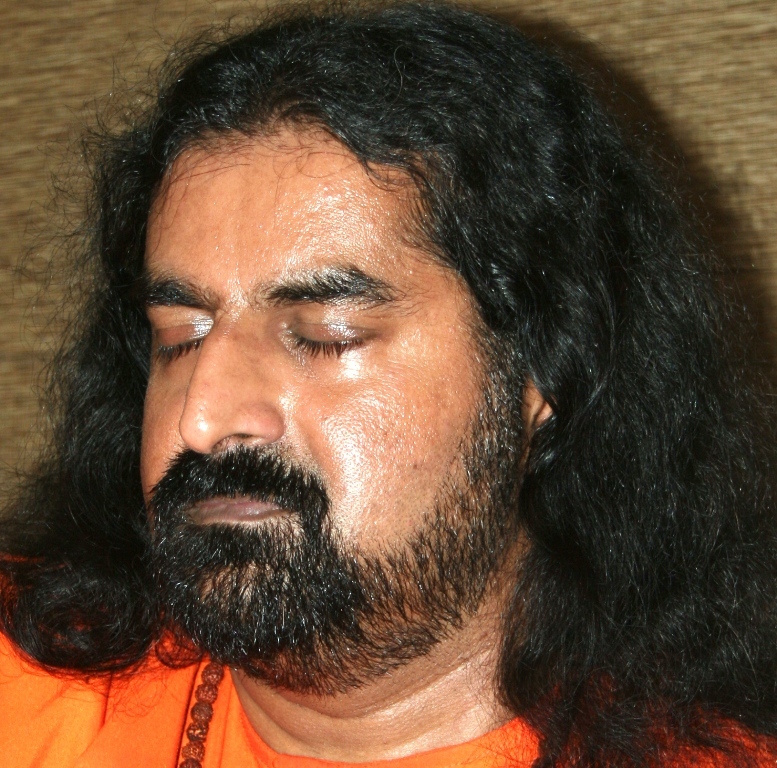 I was a bit annoyed and disappointed at the beginning, and thought I would stop doing the meditation, but I couldn’t, and soon I felt myself being in Prashanthi and the SAME experience began – Swami was there with me, and we were talking and walking around the Sai Kulwant Hall, and he was blessing me and giving me his darshan. During the part of the meditation when the arm is raised in blessing I witnessed a divine blue light coming into me, circulating within me, exiting through the raised palm and then surrounding me. At the end of the meditation, when Mohanji says to focus on your feelings, Swami came in a Blue robe. He was young, and he was smiling all the way through. As the meditation was just about to end, I quickly asked Swami “Swami please take care of my family and guide us throughout our lives.” He winked at me and went away. This is my personal experience and I am so enlightened by the events that happened within a very short time after being with Swami for long. I feel that this is a very strong message from Swami to accept and follow Mohanji’s guidance. I am very thankful and obliged to Mohanji for being with us and providing me with a simple and powerful way to connect to God. Can’t wait to see Mohanji again. Koti Pranam at Swami’s Lotus feet. The BTW Team had gathered on the morning of 18th August in Delhi from their various destinations and was immediately ready for two meditations in Gurgaon early morning. Hardly had they time to sleep. Even after hectic day in Gurgaon, everyone was still fresh and boarded train next day at 5am to Chandigarh from Delhi station. Being with Mohanji, who would feel fatigued! The journey continues. There has been on going discussion on whether to share experiences or not. Once, someone was not ready to narrate his experience in Muscat during our Thursday meditation. Mohanji told, “Our path is of Liberation. Any kind of binding will slow down your soul’s progress. We stay in the present. By not sharing the experiences, you are holding on to the experience. Holding on to anything is binding. Please, share the experience and then drop the experience and progress ahead. You never know, who will benefit from your experience.” That person immediately shared his experience. So, friends, we also continue share experiences. Aparna explicitly describes her unique experience of organizing Mohanji’s meditation in Chandigarh. She has been through the chaos of cancellation of meditation venue at the last moment. But, later with Mohanji’s grace, everything got superbly organized. Organizing meditation Chandigarh was memorable experience for Sumit, Aparna, Ravinder and Ajay. How does one describe what it is to be with Mohanji? Mohanji, I believe, is not a Master for me, but an experience. Perhaps I have lived all my life just to experience this. There were exactly three of us, at Chandigarh (Panchkula) who felt a connection with Mohanji after we received the Shaktipat from Sumit in January 2011. Since then Mohanji was just a connection, energy and that pulling voice on the CD for us. We had not seen Mohanji and we didn’t know when or if ever we would actually see him in person. So when we heard about his India visit due in August, a quiet prayer must have gone forth from Rati, Puneeta and I. 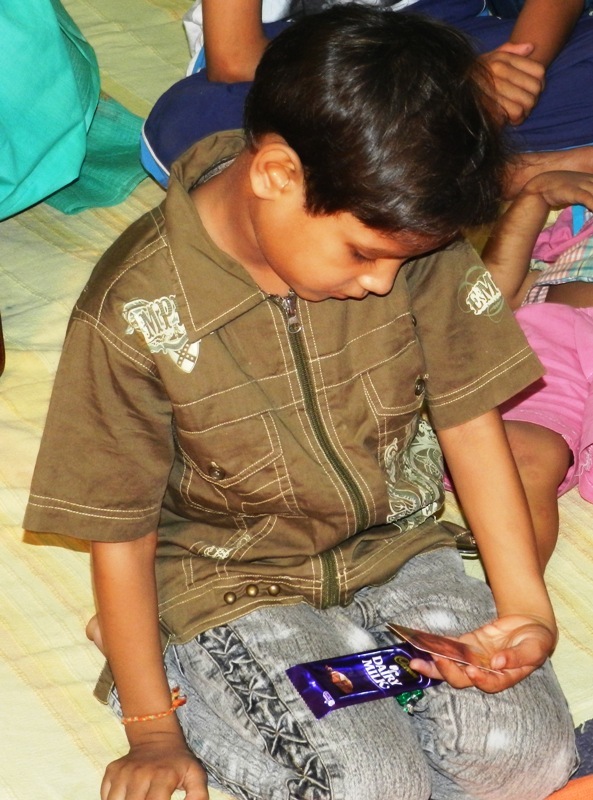 With Sumit’s encouragement, I had been organizing BTW sessions at ‘Aashiana’ orphanage in Panchkula for a few months. I believe it was the combined aspiration of those little ones which pulled Mohanji to this city on 19th August, 2011. Since there was nobody really to do the organizing bit, so the visit was almost cancelled at one point of time. Everybody declared that it had to be cancelled since I alone could not have managed things owing to my long office hours. They were right in a way. But my only thought was that I had given my word. I would continue to try. With blessings of Sathya Sai Baba, we got the beautiful Sathya Sai Seva Center as the venue. Subsequently, all other things kept falling into place one by one. How, out of the blue, Sumit received a lead which led us to an excellent guest house, an excellent vendor for food, transportation, video, generator, taxi…..everything. The evening before the event 18 August 2011, an announcement was made in the Sai Bhajan intimating them about the meditation the next day. Almost immediately, things started going wrong. Individual egos clashes within the Sai organization led to the cancellation of the venue at 9.30 at night. I was totally shaken. I informed my dad who said: “Inform Sumit and cancel the program.”But Sumit, even though he was in the midst of hectic activity, was totally unperturbed. Not once did his voice waver and he simply asked me to check out the Banquet halls in near by hotels. Again, Sai smiled and we got an offer to hold it in D C Model school free of cost! This is a school founded and run by a long time Sai devotee, Mr. Gupta and most of the teachers and students are Sai devotees. Since it was to be a working day for school, I was very apprehensive about the noise but we agreed anyway. so, small, but his innocence was touched by Mohanji. Whereas only 29 persons had registered initially, over a 100 ended up attending the meditation.In the new venue, many school children and teachers could also attend. The meditation was extremely powerful. I usually connect with Krishna or the Mother during meditation but that day there were only and only Shirdi Sai, Sathya Sai and Mohanji, totally palpable in the entire atmosphere. Many first timers for meditation were also astounded experiencing powerful energies.At one point, my mother turned to Rati and asked- “Is all this really happening?” Whenever Sumit gives Shaktipat, he usually gently places one hand over your head. But I have always felt it at two hands tightly gripping my head from all sides and a finger on my third eye. Long after the meditation I finally gathered my bearings and decided to go out and check if the lunch vendor had arrived. 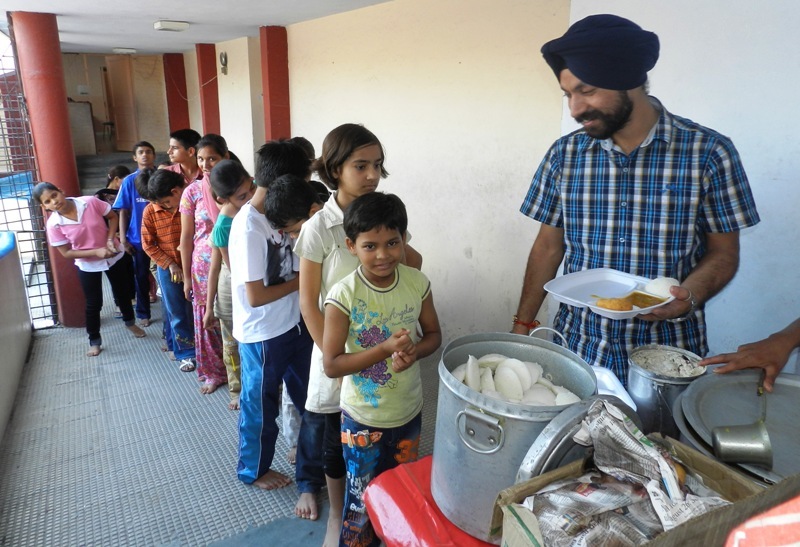 What I saw was the lunch had already been cooked, served, and Aashiana kids were ready to leave. “The Masters will do it all.” As I said, people appeared from nowhere and took charge and everything was done. “The Masters will do it all.” People appeared from nowhere and took charge and everything was done. Heartfelt thanks to Ravinder and Ajay. Later, we accompanied Mohanji to the Principal’s residence where an impromptu question and answer round happened. Here I would like to mention that the Guptas, had acutely been feeling the loss of Sathya Sai’s physical presence for the past months. But in Mohanji’s presence, they received a Divine connection and answer to their longing. I only saw gratitude writ large on their faces. Now we are having weekly meditation sessions at the School every Friday. Divine plans in advance; we get to know later! During the Q&A round Mohanji mentioned the next two days’ meditations at Delhi and asked me to join in. I had been very hesitant to ask my parents for permission since my son had his exams. Mohanji said “Ask, ask now.” Dad agreed and I packed my bags. Next was to get to Delhi without any train booking. Shashank, who had to travel back had already left. I wasn’t finding any other means of transport. Again, Sumit declared, in his characteristic soft voice: “We have an extra ticket”. Actually he had been trying to cancel the extra ticket all night but somehow, every time he tried, his computer would hang. Out of nowhere, I had an itinerary, a purpose and a ticket in hand. Divine plans in advance; we get to know later! Children of Ashiana. There was more drama to come. Once we had boarded the train, a good half an hour later I realized that I had left my precious new Camera on the railway station at the luggage checking counter. The train had already started and I was distraught as I had bought this expensive camera after long months of waiting and had not even paid the full installment as yet. There was no way you would get it back from the most crime prone city’s most crowded public place. I stood in front of Mohanji, directly looking into his eyes telling him to get me back my camera. We called up at least ten friends in Delhi to go to the station and check for the camera, but incidentally either they were hours away in other cities or they didn’t take the calls. Just then a co-passenger heard the commotion and offered to ask his relative who might be on the station if his train had not already left. That train was delayed by the Masters, and the gentleman, himself a railway employee pulled the right strings and got my camera back. And out of all cities, he was going to Saharanpur, where my return train was to stop the next day. I got my camera back and ended up making friends with complete strangers. In the train, I finally got long hours to talk to Mohanji. For all these two days I hadn’t asked any of my personal questions to Mohanji, but while giving answers to others he had been answering each and every personal problem of mine. Those few hours spent interacting so closely with the Master will probably shine for eternity in this lifetime of mine, even on the other side of the grave. It’s true that what we call the Divine Grace may be too strong for human mind to comprehend, but it is just right for human soul to experience. What I learned from the Chandigarh session, how the venue hall was cancelled at the last moment and the venue shifted to this school. Apparently we couldn’t understand the deeper reason behind. Because at this school, the way the Principal and his wife, hosted Mohanji, offering every bit of their life, every possible service at his feet was extraordinary. That respect, the sheer love and gratitude on their faces and in their acts was palpable. How lovingly Mohanji gave shaktipat to each and every person, including the orphan children, the school children, the school staff, Chandigarh team and innumerable people from all around the city for hours after the meditation. Not bothering about the heat, whether he had had even a glass of water or not, not showing any sign of fatigue, focusing only on his Dharma, he was the last person to leave the hall. Those children were very loving. It was overwhelming to see how the orphan children responded to his love. The moment he would place his hand on their heads for Shaktipat, they would burst out crying. Seeing this, many other people cried. Purity was at its peak there in that hall. The Principle and his wife had been feeling the strong vacuum after Sathya Sai Baba left that only disciples who have had such proximity with the Divine, can feel. Mohanji stepped into their house to completely fill in this gap. It was then we realized the entire purpose of the venue shifting to this school. Mohanji was served lunch and a spontaneous question and answer round followed which lasted for almost two and a half hours. Many individual questions were answered right from the rituals and methods of performing Shraadh, to somebody’s entire life purpose to their family’s fortunes or misfortunes- Mohanji gave answers to everything from past present and future. Mohanji presented 'The Power of Purity' book to Mrs. Gupta for school library. There were two important things I witnessed here. First – The way Aparrna and her team worked, with full heart and the way they had been conducting meditations in Chandigarh without having met Mohanji even once-this work was well rewarded in Chandigarh. More than 100 people saw Mohanji for the first time and many even meditated for the first time. The tremendous experiences they had were evident in the expressions. This Shaktipat opened even further doors in Chandigarh. Second – It was a very special moment for the Principal couple when Mohanji graced their home and spent the rest of the day there answering questions, giving unconditional love. After Mohanji’s visit we have been using this venue regularly for the meditation with all their support. Once, during the preparation period I was talking to Aparrna on phone, conscious that she was single handedly trying to organize things. Ravinder and Rajesh were sitting next to me and suddenly I happened to assure Aparrna that both of them would join her at Chandigarh to help out on the day of the meditation. I realized the purpose of this promise much later when on the last day the venue got cancelled and everything was in chaos. At that time, we realized how beautifully both of them managed everything on the day of the event. The most wonderful thing was that both of them did everything totally selflessly, traveling the long, rough bus ride to Chandigarh, managing everything behind the scenes and then quietly came back to Jammu to help with the organizing bit here. Not a word of their efforts nor any desire for recognition marked the purity of actions of these two wonderful persons. We later realized the entire purpose behind the venue shifting to this school.